The pressure-volume (P-V) curve has been suggested as a bedside tool to set mechanical ventilation; however, it reflects a global behavior of the lung without giving information on the regional mechanical properties. Regional P-V (PVr) curves derived from electrical impedance tomography (EIT) could provide valuable clinical information at bedside, being able to explore the regional mechanics of the lung. In the present study, we hypothesized that regional P-V curves would provide different information from those obtained from global P-V curves, both in terms of upper and lower inflection points. Therefore, we constructed pressure-volume curves for each pixel row from non-dependent to dependent lung regions of patients affected by acute hypoxemic respiratory failure (AHRF) and acute respiratory distress syndrome (ARDS). 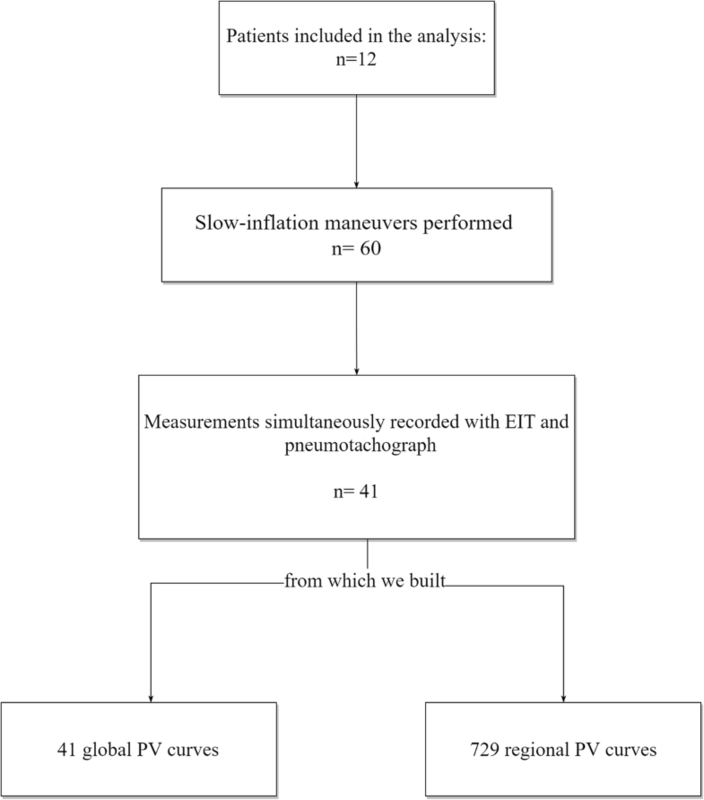 We analyzed slow-inflation P-V maneuvers data from 12 mechanically ventilated patients. During the inflation, the pneumotachograph was used to record flow and airway pressure while the EIT signals were recorded digitally. From each maneuver, global respiratory system P-V curve (PVg) and PVr curves were obtained, each one corresponding to a pixel row within the EIT image. PVg and PVr curves were fitted using a sigmoidal equation, and the upper (UIP) and lower (LIP) inflection points for each curve were mathematically identified; LIP and UIP from PVg were respectively called LIPg and UIPg. From each measurement, the highest regional LIP (LIPrMAX) and the lowest regional UIP (UIPrMIN) were identified and the pressure difference between those two points was defined as linear driving pressure (ΔPLIN). A significant difference (p < 0.001) was found between LIPrMAX (15.8 [9.2–21.1] cmH2O) and LIPg (2.9 [2.2–8.9] cmH2O); in all measurements, the LIPrMAX was higher than the corresponding LIPg. We found a significant difference (p < 0.005) between UIPrMIN (30.1 [23.5–37.6] cmH2O) and UIPg (40.5 [34.2–45] cmH2O), the UIPrMIN always being lower than the corresponding UIPg. Median ΔPLIN was 12.6 [7.4–20.8] cmH2O and in 56% of cases was < 14 cmH2O. Regional inflection points derived by EIT show high variability reflecting lung heterogeneity. Regional P-V curves obtained by EIT could convey more sensitive information than global lung mechanics on the pressures within which all lung regions express linear compliance. Clinicaltrials.gov, NCT02907840. Registered on 20 September 2016. The online version of this article ( https://doi.org/10.1186/s13054-019-2417-6) contains supplementary material, which is available to authorized users. Although mechanical ventilation (MV) might be necessary to maintain adequate gas exchanges in patients with acute respiratory failure, ventilator-induced lung injury (VILI) can amplify local and systemic inflammation and contribute to disease progression [1, 2, 3]. VILI is caused by multiple mechanisms such as high volumes, high pressures, and cyclic opening and closing of the peripheral airways . Moreover, lungs with patchy infiltrates are heterogeneous and have considerable parenchyma loss of volume available for ventilation . The gravitational increasing weight of the parenchyma and the inhomogeneous inflammation process create differences between lung units located in different regions of the lungs, with different distending pressures, dynamic behavior, and therefore physiologic needs [6, 7]. Information coming from mechanical respiratory properties assessed through airway pressure (Paw) characterize the global behavior of the lung but possibly cannot identify regional peculiarities. The pressure-volume (P-V) curve is a respiratory monitoring technique that explores changes in the respiratory system compliance along a wide range of Paw (e.g., between 0 and 40 cmH2O). A P-V curve usually has sigmoidal shape  with two inflection points—the lower (LIP) and the upper (UIP)—and an almost linear part in between. The physiological interpretation of the P-V curve classically considers the region between the boundaries of the LIP and UIP as safe for mechanical ventilation (i.e., a PEEP level higher than LIP and plateau pressure lower than UIP) to prevent both atelectrauma and barotrauma [9, 10]. However, one can question whether that this approach is able to prevent VILI since it considers the respiratory system as a whole and does not take into account the local mechanical behavior which is influenced by gravity and super-imposed pressures . In fact, it is possible that the same airway pressure might overinflate parts of the lung while being harmless for others or that a certain level of positive end-expiratory pressure (PEEP) is able to keep parts of the lung ventilated not being enough for others. Electrical impedance tomography (EIT) is a radiation-free lung imaging technique, which allows continuous bedside monitoring of the regional mechanical properties by measuring changes in impedance associated with ventilation [12, 13, 14, 15]. In the present study, we hypothesized that regional P-V curves would provide different information from those obtained from global P-V curves, both in terms of upper and lower inflection points. To confirm this hypothesis, we constructed pressure-volume curves for each pixel row from non-dependent to dependent lung regions of patients affected by acute hypoxemic respiratory failure (AHRF) and acute respiratory distress syndrome (ARDS) . 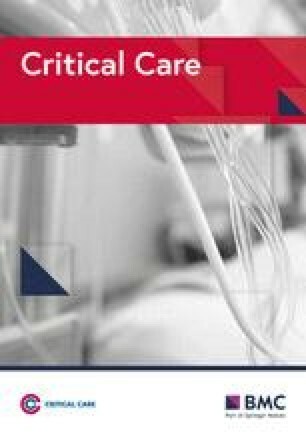 We performed a new and additional analysis of data collected during a prospective study carried out in the intensive care unit (ICU) of Azienda Ospedaliera Universitaria Sant’Anna (Ferrara, Italy) between December 2015 and October 2016. We enrolled adult patients (aged ≥ 18 years) with AHRF or ARDS, who were deeply sedated and paralyzed as per clinical decision with a ratio of partial pressure of oxygen in arterial blood to fraction of inspired oxygen (PaO2/FiO2) ≤ 300 mmHg and clinical PEEP ≥ 5 cmH2O. Exclusion criteria were (a) refusal to participate to the study, (b) pregnancy, (c) pulmonary cardiogenic edema, (d) unstable hemodynamics (defined by a systolic arterial pressure of 90 mmHg or less or mean arterial pressure of 60 mmHg or less), (e) pneumothorax, (f) severe chronic obstructive pulmonary disease, (g) impossibility to correctly position the EIT belt (e.g., chest drainage, surgical wound dressings), and (h) contraindications to EIT monitoring (e.g., pacemaker, automatic implantable cardioverter defibrillator). The ethical committee of Ferrara, (protocol no. 141285) Italy, approved the study, and informed consent was obtained following local regulations. At enrollment, we collected demographic and clinical data of each patient. Patients were in supine position, deeply sedated with propofol and morphine, and paralyzed with rocuronium bromide during the study protocol. A heated pneumotachograph (Fleisch no. 2, Fleisch, Lausanne, Switzerland) was positioned at the airway opening to record Paw and flow. Volumes were derived by integrating the flow signal. An oblique textile electrode belt with 32 active electrodes was placed around the chest along the 4th and the 6th intercostal space, and EIT recordings were performed using the Swisstom BB2 system (Swisstom, Landquart, Switzerland) . The EIT device selected the dimension of the belt based on the circumference of the patient’s hemithorax and adapted the thorax contour according to the entered height, weight, and gender. Heart rate, arterial pressure, SpO2, and EtCO2 were continuously monitored during the study. Additional details have been published in a previous study . Each P-V curve maneuver was carried out using the constant slow-flow inflation technique, as previously described . During the inflation, the pneumotachograph was used to record flow and Paw while the EIT signals were digitally recorded on a dedicated USB drive. The P-V curves were performed at three different PEEP levels: 5 cmH2O, 10 cmH2O, and 15 cmH2O. At each measurement, we monitored also hemodynamic and respiratory parameters (peak pressure, plateau pressure, PEEPtot, respiratory system compliance), obtained by an end-inspiratory and end-expiratory occlusions . The new analysis was performed only on measurements simultaneously recorded by EIT and pneumotachograph. For each pressure-volume curve maneuver, a global P-V curve (PVg) was built, plotting Paw versus volume. EIT dynamic images recorded during inflation were analyzed as follows: to obtain regional P-V curves, the impedance change (ΔZ) in the predefined lung region of the dynamic EIT images was grouped into regions of interest (ROIs), according to the gravitational vector, in a craniocaudal direction (region 1: non-dependent area, region 1 + n: dependent lung). The analysis was conducted in 19 gravity-dependent regions of interest, each one corresponding to a row of pixels. On each ROI, the ΔZ during the slow inflation maneuver was plotted against the corresponding Paw. In this way, we obtained regional P-V (PVr) curves, one for each ROI [19, 20, 21, 22]. To compare different ROIs, both ΔV and ΔZ during the maneuver were normalized to 1. Lower and upper inflection points were estimated by fitting a sigmoidal equation (Eq. 1) into the PVg, as previously described . To fit the PVr, we adapted Eq. 1 assuming that ΔZ = ΔV (Eq. 2); we also limited the values of a and b to keep their value in a physiological range. The regional P-V curves were considered valid if the quality of the fitting R2 > 0.9. Measurements with negative inflection points were considered invalid. An illustrative analysis of one measurement from a representative patient is shown in Fig. 1. Data are presented as median and interquartile range (IQR). Wilcoxon matched-pairs signed rank test was used to evaluate differences between paired data. Mann-Whitney test was used to compare unpaired groups of data. Statistical analyses were performed using SPSS 20.0 statistical software (IBM, Armonk, NY, USA) and GraphPad Prism 6 for Windows (GraphPad Software, La Jolla, CA, USA, www.graphpad.com). In all statistical analyses, a two-tailed test was performed and the p value equal or less than 0.05 was considered statistically significant. Patients’ characteristics are summarized in Table 1. Of note, 5/12 (42%) had ARDS. Forty-one measurements from 12 patients were considered of sufficient technical quality for the analysis. The PaO2/FiO2 at enrollment was 218 [170–262] cmH2O, and the median clinical PEEP used was 7.5 cmH2O. From the 41 measurements, we built 729 PVr and 41 PVg (Fig. 2). A valid LIPg was found in 37% of measurements; its median value was 2.9 [2.2–8.9] cmH2O. 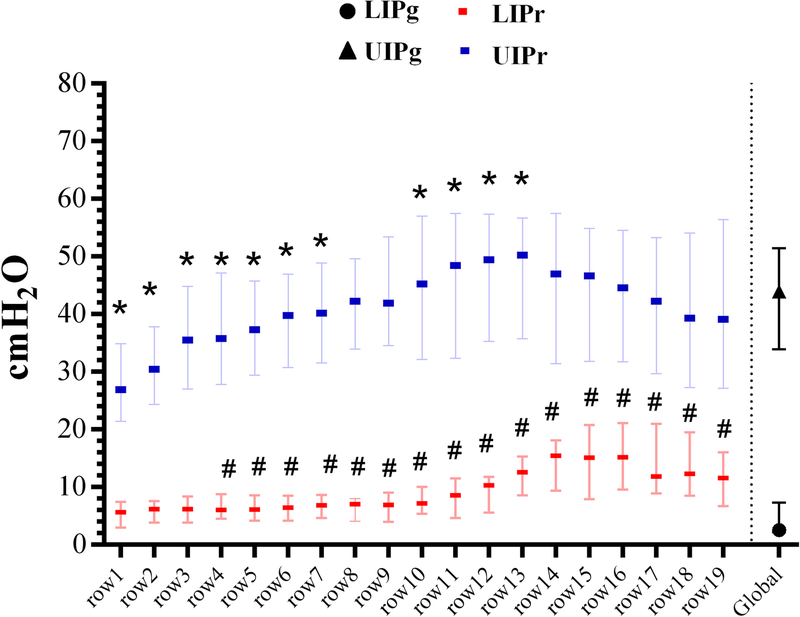 LIPr values increased from the non-dependent to the dependent lung (Fig. 3). Comparing LIPr to the LIPg, we found statistically significant difference in rows 4–19 but not in the least dependent ones (rows 1–3). A statistically significant difference was also found between the LIPg and LIPrMAX (15.8 [9.2–21.1] cmH2O; p < 0.05). LIPrMAX was in the last five most dependent ROIs in 77% of measurements (Fig. 4). The median UIPg value was 40.5 [34.2–45] cmH2O. A statistically significant difference was found between UIPg and UIPrMIN (30.1 [23.5–37.6] cmH2O; p < 0.05), with UIPrMIN located in the four most non-dependent regions in 55% of measurements (Fig. 4). A supplemental analysis, based on the level of PEEP, can be found in the supplemental digital content (Additional file 1: Table S1). 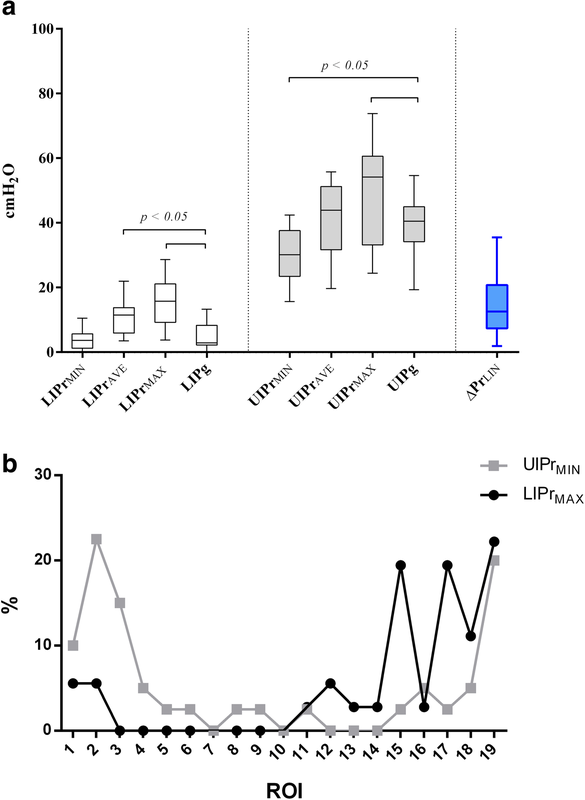 The pressure interval between LIPrMAX and UIPrMIN (ΔPrLIN; Fig. 1) was 12.6 [7.4–20.8] cmH2O (Fig. 3). In 56% of measurements, ΔPrLIN was lower than 14 cmH2O. The pressure interval between each regional LIPr and UIPr (RLC) is reported in Additional file 2: Figure S1; we found a high variability in this value, which was higher in the central lung and lower in both the most dependent and the non-dependent lung. The main results of this study are as follows: (1) The global P-V and the regional P-V curves do not provide the same information, and inflection points of the global P-V curve are different from those of the PVr (i.e., higher LIP and lower UIP); (2) the analysis of the regional P-V curves allows to detect the heterogeneity of the inflection points of the different lung regions; regional inflection points are gravity dependent with UIPrMIN located in the most non-dependent lung and LIPrMAX in the most dependent; (3) the “safe” limit of pressure between LIPrMAX and UIPrMIN was reduced compared to the one obtained by global P-V curve (Table 2). Different attempts have been made in the last 30 years for use of the P-V curve of the respiratory system to set mechanical ventilation [9, 10]. The inflection points of this curve express changes in compliance, reflecting a rise in ventilated alveolar units—due to alveolar recruitment or airway opening or both, or a pressure that exceed intrinsic PEEP—(for LIP) and the overstretching of already ventilated lung (for UIP). Hence, setting mechanical ventilation in the linear part of the curve between these two points could be protective against both intra-tidal alveolar opening and closing (atelectrauma) and overinflation (barotrauma/volutrauma). Despite the physiological background, this approach considers the lung as a homogenous mono-compartimental system without taking the entity of regional inflammation  and the gravitational superimposed pressure on each region into account . On the one hand, the LIP of the global P-V curve has been classically considered the critical opening pressure at which alveoli start to open or to be fully recruited but this concept has recently been questioned. A mathematical model of ARDS  and CT scans on patients affected by ALI/ARDS  showed that recruitment of new units occurs also beyond the LIP, influencing the slope of the P-V curve. Moreover, alveolar opening pressure (i.e., recruitment) is not a fixed threshold but a continuous range of pressure, progressively increasing from the non-dependent to the dependent lung. Finally, LIP could represent reversal of airway closure rather than alveolar recruitment . We confirmed these findings since we found a gradient of regional lower inflection points from the non-dependent to the dependent lung: moving toward the vertebral-dependent lung, the LIPr increases, probably as an effect of the highest alveolar (or small airways pressure) pressure needed to overcome the resultant superimposed pressure (Fig. 3). Moreover, we found a significant difference between the LIPg, the regional minimum LIP (LIPrMIN), and the LIPr in the most non-dependent lung (ROIs 1, 2, 3). Therefore, the LIP on the global P-V curve may express the behavior of the uppermost compartment that receives air at the beginning of inflation, as already suggested by Hickling using a mathematical model . This would, however, imply that information about the LIPr in the central and dependent lung is not adequately reflected by the global P-V curve. Since the dependent lung is the region most affected by intra-tidal recruitment and airway closure due to the higher pressure needed to start inflation, using the global LIP—that expresses the behavior of the non-dependent lung—to set PEEP would leave large dependent regions prone to atelectrauma. Our data show that the minimal pressure needed to ventilate above all regional LIP (LIPrMAX) was 15.8 [9.25–21.1] cmH2O, a value much higher than that derived from the LIPg. If we hypothesize that the ideal ventilation should occur on the linear part of each regional P-V curve and that the starting point of the respiratory cycle is PEEP, then LIPg would underestimate the value to achieve this target. On the other hand, alveolar overdistension leads to compression of pulmonary vessels and capillaries, disruption of alveolar epithelium, and physical breaks in endothelial plasma membranes  triggering the proinflammatory signaling cascade which results in inflammation, edema, and cell death . Titrate tidal volume to keep a plateau pressure below the “overdistension threshold” can be useful to avoid lung inflammation. Amato et al. found a massive reduction of 28-day mortality (38% vs 71%) in patients ventilated with low tidal volumes (6 ml/kg/PBW); this finding was later confirmed by large-scale RCTs  and meta-analysis  proposing low tidal volume ventilation as the standard of care. Despite this potential advantage, PBW is not an accurate index of the actual lung size since it does not express the dimension of the baby lung [5, 31]. The upper inflection point is considered the beginning of lung overstretch and, ideally, could be used to titrate indirectly TV on the lung size. Roupie et al. found that, in a ventilation based on a TV = 10 ml/kg, in 80% of the studied population the TV needed to be reduced to 7.8 ± 0.9 ml/kg to obtain a Pplat below the UIP. We found that UIPg was not able to highlight the regional overstretch since UIPg differed from UIPrMIN, a value that corresponds to the lowest pressure at which regional overinflation starts. Moreover, UIPg was different from UIPr in the non-dependent lung (Fig. 3); using the UIPg to limit pressure can therefore underestimate the potential damage on this region. In our population, UIPrMIN was 30.1 [23.5–37.6] cmH2O, not far from the suggested as protective Pplat threshold found in AHRF patients affected by sepsis [32, 33]. In addition, a recent multilevel mediation analysis on 3562 ARDS patients showed that a reduction of Pplat < 30 H2O could not further improve survival rate. It is important to underline that in our population the range was wide, from a minimum of 13.9 cmH2O to a maximum of 49.7 cmH2O, being below 30 cmH2O in 44% of measurements. A fixed value, 30 cmH2O in this case, cannot represent therefore the universal safe number, suggesting that a tailored safe threshold should be set based on the patient’s characteristics. In this analysis, we introduced two variables: LIPrMAX—the minimal pressure able to overcome all regional lower inflection points—and UIPrMIN—the maximal pressure to avoid a ventilation above all regional upper inflection points. We hypothesize that LIPrMAX can be helpful in setting PEEP while UIPrMIN can represent a pressure limit to avoid regional overstretch. Recently, respiratory driving pressure (DP) has been found to predict mortality in ARDS patients  and a titration of TV on DP has been suggested to reduce VILI [35, 36]. The connection between DP and overdistension has been furthermore confirmed by a CT scan study on humans . In the current analysis, we introduced a new variable: ΔPLIN. Its value reflects the maximal pressure range which avoids regional overinflation and derecruitment, thereby allowing a ventilation simultaneously above every regional LIP and below every regional UIP. ΔPLIN expresses, therefore, individual threshold pressures, above which VILI might occur. In our study population, although mean ΔPLIN was 12.6 [7.4–20.8] cmH2O and therefore close to the value defined as protective in a recent prospective study , in 56% of the cases, it was below 14 cmH2O, the limit value of driving pressure suggested by Amato et al. . 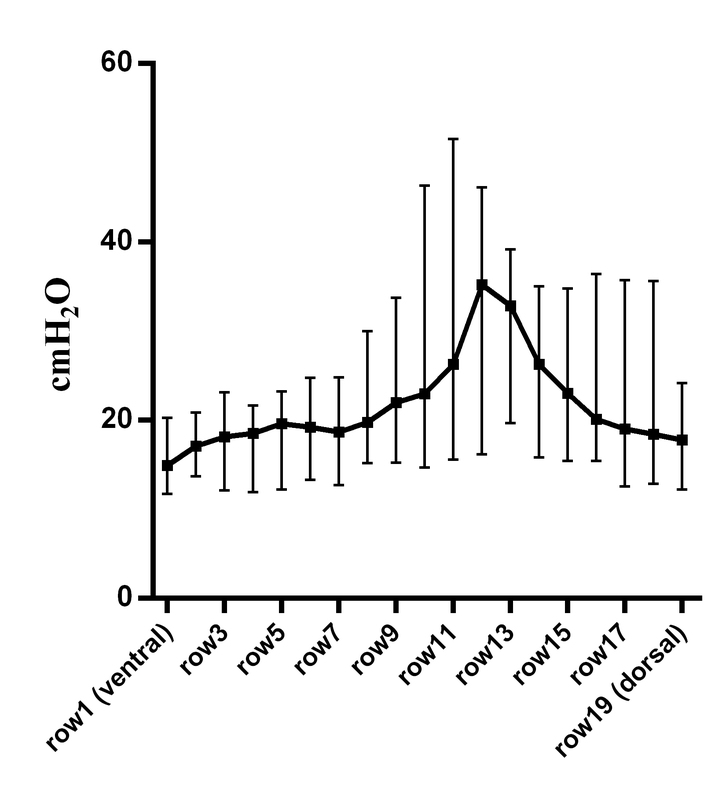 This indicates that, in some patients, a driving pressure threshold of 14 cmH2O, despite generally considered protective, would be slightly too high in order to prevent regional damage (Fig. 4). Our results underline that the traditional P-V curve could give partial information on the way patients should be ventilated. The linear part of pressure-volume relationship does not pertain to all lung regions, being instead a compromise between the mechanical characteristics of the dependent and not dependent part of the lung. Since it is fundamental to select the correct amount of PEEP to limit atelectrauma, while avoiding overcoming the UIP to limit overdistension, patients could be ventilated in the linear portion of the P-V curves taking into account all lung regions. We were able to find this linearity in the entire lung regions by simply using the maximal LIP and the minimal UIP. LIP and UIP exhibited a huge variability among patients, underlining that mechanical ventilation must be personalized. It is tempting to say that the analysis of the regional P-V curves could help in achieving this goal. In particular, it remains to be elucidated whether the VT associated with linear regional DP is able to control CO2 and if this new approach could lead to a novel indication for extracorporeal lung assist . Our study has several limitations. Firstly, we performed only inspiratory pressure-volume curve, as it is the most used for evaluating the variability of the compliance of the respiratory system. Alternatively, a physician could examine the expiratory limb of the curve to evaluate closure pressure. However, we decided to use the same methodology used in a RCT to set PEEP using the P-V curve . Secondly, the study population consisted of a limited number of patients with heterogeneous diseases; therefore, no inferences on the patient outcome can be derived from our data. Thirdly, we did not measure transpulmonary pressure: this tool would have been useful to distinguish between the respiratory system and lung regional inflection points. Fourthly, the lack of randomization of PEEP levels and the return to zero pressure at the end of each step could have influenced the results of this study . Regional inflection points derived by EIT show high variability, reflecting the heterogeneity of the lung. 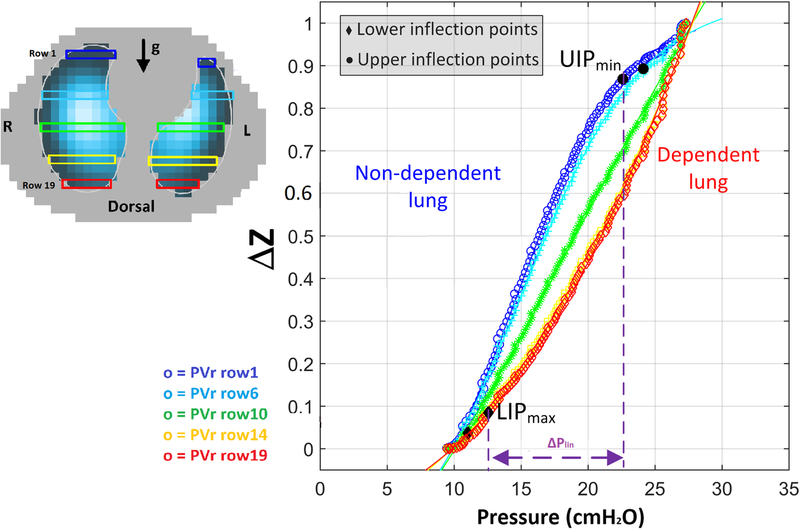 Regional P-V curves obtained by EIT could convey more sensitive information than global lung mechanics on pressures within which all lung regions express linear compliance. Future studies will explore if setting mechanical ventilation based on regional P-V curves could impact on patients’ outcome. We thank the nursing and medical staff of the intensive care unit at Sant’Anna Hospital, Ferrara, Italy. The present study was supported by institutional funding of the Department of Morphology, Surgery and Experimental Medicine, Section of Anesthesia and Intensive Care, University of Ferrara, Italy. The company Swisstom AG supported the study by granting use of an electrical impedance tomography system free of charge but it had no role in study conception, design and completion. GS, SS, and CAV conceived of and coordinated the study, participated in its design, and helped to draft and review the manuscript. TM contributed to the interpretation of the data and was involved in revising the manuscript. GS, SS, RR, and EM contributed to the analysis and interpretation of the data and were involved in revising the manuscript. SHB and ADW contributed technical help during data analysis and revision of the final manuscript. GS and SS performed the statistical analysis and helped to carry out the data analysis. EM and ES reviewed the manuscript constructively. All authors meet all authorship requirements of the International Committee of Medical Journal Editors. All authors read and approved the final manuscript. This manuscript is a secondary analysis of data coming from a prospective trial. The study was approved by the ethics committee of the Sant’ Anna Hospital, Ferrara, Italy (Protocol n. 141285). Written informed consent was obtained from the patients or their relatives for publication of their individual details. The consent forms are help by the authors and are available for review by the editor-in-chief of this journal. Petrucci N, De Feo C. Lung protective ventilation strategy for the acute respiratory distress syndrome. Cochrane Database Syst Rev. 2013:CD003844. https://doi.org/10.1002/14651858.CD003844.pub4.